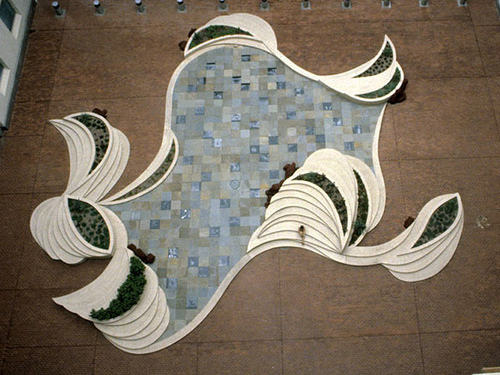 Artist Molly Gochman is drawing her newest land art piece directly on the surface of the earth, at a large enough scale that it will only be legible as a whole to passengers flying in or out of the nearby George Bush International Airport in Houston. 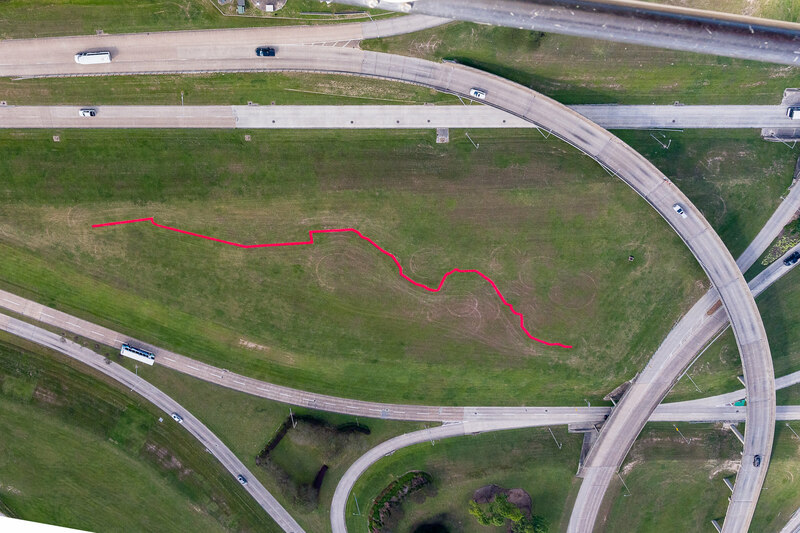 Border US-MX, 2018, International Airport Houston will be a temporary artwork in the shape of the U.S.–Mexico border drawn in a bright red color in the middle of a highway interchange. Gochman said in a statement that the work is meant to raise awareness about human trafficking. Her ongoing Red Sand Project is a participatory artwork that invites people to fill in cracks with red sand, and then document and share the result to encourage discussion and activism on the issue. Gochman said in a statement: "The undulating, irregular border of Texas—created by the natural curves of Rio Grande—in contrast with the straight lines and edges of the other states, highlights the arbitrary ways in which borders are drawn." The 650-foot-long work evolved out of "the ways in which borders and migration connect to vulnerabilities and susceptibility to exploitation," Gochman said in a statement. The work will be up through the end of April. According to a report in Las Vegas Weekly, the Conservation Lands Foundation is pushing to make a project by land artist Michael Heizer, of "Levitated Mass" fame, a national monument. 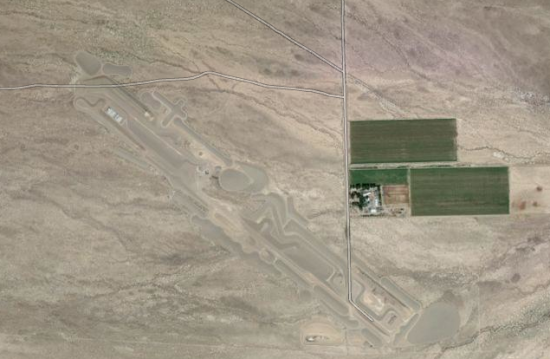 The newly threatened City installation is a still-incomplete collection of giant abstract structures stretching for more than a mile into the Nevada Desert. The move came after the failure of Nevada Senator Harry Reid's Garden Valley Withdrawal Act, attempting to keep the land—and more than 800,000 square miles of adjacent federal property in Garden Valley—free from mining. Critics have complained that it's a convenient tool in the effort to keep the area free of industrial activity, but conservationists argue that the unspoiled area as a whole is worth saving. “These are two of the most scenic valleys in Nevada, two of the most undisturbed, least-roaded, and least populated portions of the state and therefore the country," Brian O’Donnell, executive director of the Conservation Lands Foundation, told Las Vegas Review Journal. 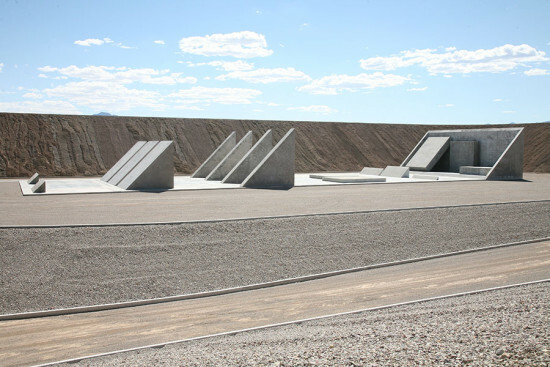 Heizer, who has been working on the piece since the 1970s, plans to open it to the public once it's complete. Made of dirt, rocks, and concrete, City considered by some to be the largest piece of land art in the world. 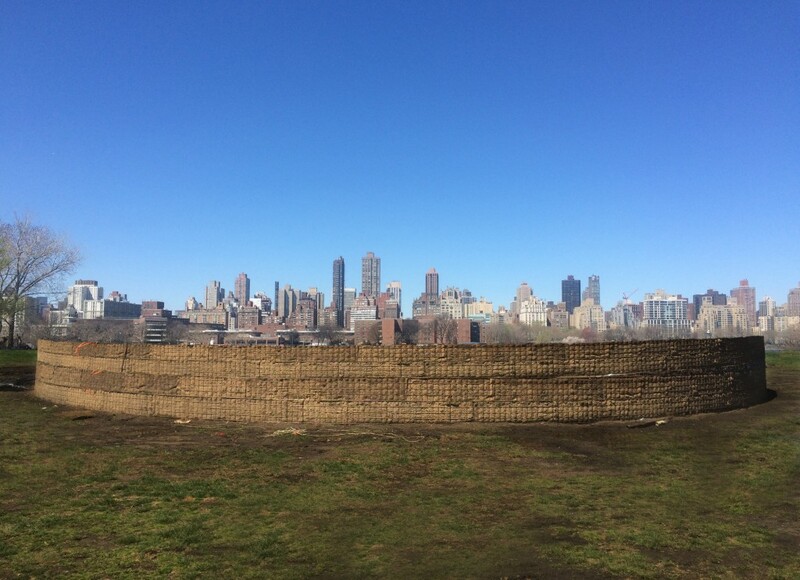 But since the artist hasn't allowed visitors, many assertions about the piece remain unclear. Stanley was a correspondence artist and we met via the mail before we met in person. He had giant size stationary and envelopes, and of course large rubber stamps. When we met in person in 1973 he invited Ant Farm to make a proposal to do a project in Amarillo. It was called Cadillac Ranch from the get go as you can see from the blueprint proposal we sent him. In a letter he sent us dated March 8, 1974, Stanley wrote, "It's going to take me awhile to get used to the idea of Cadillac Ranch. 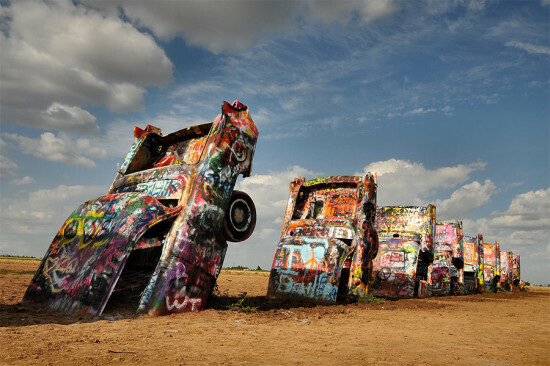 I'll answer you by April Fool's day...If we put the Cadillac Ranch on Highway 66, near my airport, would the bodies of the Cadillacs lean towards the highway (south) or would they lean towards the prairie (north)? That's an important consideration." He was already thinking about publicity and wrote, "I like publicity. I want to see my name in lights in Times Square, but I do not want publicity in Amarillo, Texas. That is because I own a television station here and nearly any publicity concerning me would affect the station and post possibly would be distorted by some of the competitive media trying to harm me or the station...So I would want a media blackout as far as television, radio, and the newspapers in the Texas Panhandle are concerned. Of course, if they want to resurrect LIFE magazine for me, that would be fine." Marsh has recently been accused of sexual harassment which he denied. He was hospitalized for two weeks with "various health issues, and was 76 at the time of his death. He wanted his epitaph to read "Thanks, everybody. I had a good time." In an about face, New Jersey Governor Chris Christie reversed a decision to demolish Athena Tacha's Green Acres, a site specific installation at the State's Department of Environmental Protection. 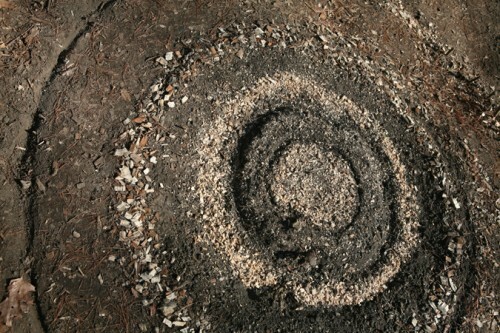 Tacha is largely credited with bringing the land art movement into the social context of architecture. The 1985 sculpture's staying power remains contingent upon private funding to restore the piece. With Art Pride New Jersey, Preservation New Jersey, and The Cultural Landscape Foundation all rallying to the cause, Green Acres looks like it will remain the place to be. Beginning her artistic career in the 1960s, Nancy Holt helped pioneer the Land Art movement alongside artists like Richard Serra and Robert Smithson, who was her husband and occasional collaborator. 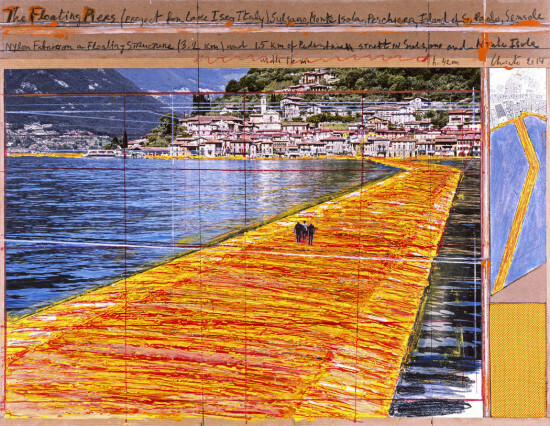 Nancy Holt: Sightlines at the Graham Foundation presents documentation of over 40 of her monumental and ecologically-focused projects through photography, film, and artist’s books, revealing Holt’s eloquent mode of navigating the intersection of art and nature. 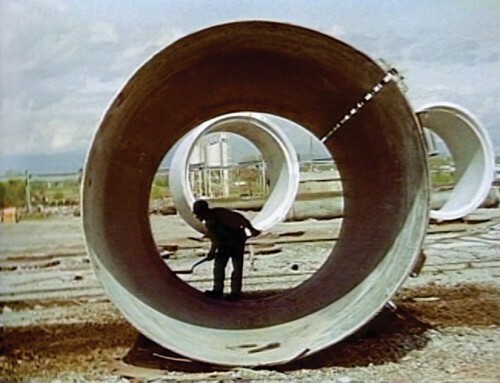 In Sun Tunnels, an installation and 1978 film (above), sunlight interacts with four concrete tunnels in the Great Basin Desert in Utah, exemplifying Holt’s interest in space and time by highlighting how the passage of the sun impacts each tunnel differently and in a way specific to that location. In addition to presenting previously unseen materials from the artist’s archive, the exhibition, which concentrates on the Holt’s work between 1966 and 1980, features the documentary Pine Barrens (1975) about undeveloped land in New Jersey, and documentation of the projects Swamp (1971, in collaboration with Smithson), Boomerang (1973, in collaboration with Serra), and the multi-monitor installation Points of View (1974), a piece that underscores the different perspectives we bring to viewing the landscape.